Roger Federer beat Marton Fucsovics to reach the Dubai Tennis Championships semi-finals and close in on his 100th ATP singles title. The Swiss was pushed by the Hungarian world number 35 but came through 7-6 (8-6) 6-4 in one hour 57 minutes. If Federer wins an eighth title in Dubai he will become just the second player to win 100 singles titles after American Jimmy Connors, who won 109. Federer will play sixth seed Borna Coric of Croatia in the last four. 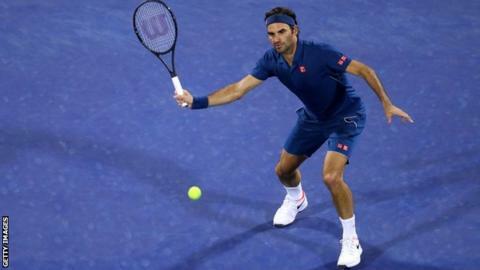 Twenty-time Grand Slam champion Federer, currently seventh in the world, is the highest ranked player remaining in the draw with Greece's Stefanos Tsitsipas meeting Frenchman Gael Monfils in the other semi-final. World number 11 Tsitsipas, who knocked Federer out of January's Australian Open, beat Poland's Hubert Hurkacz 7-6 (7-4) 6-7 (1-7) 6-1. The 20-year-old could break into the world's top 10 for the first time by progressing in Dubai. Monfils also needed three sets to beat qualifier Ricardas Berankis, winning 6-1 6-7 (3-7) 6-2.